The book idea that inspired us to start this mother/daughter food blog is now a reality! 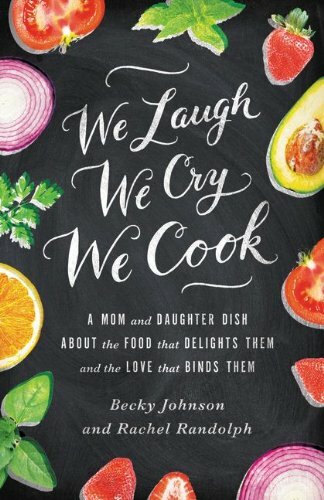 We Laugh, We Cry, We Cook: A Mother and Daughter Dish About the Food That Delights Them and the Love that Binds Them, our humorous food memoir with recipes at the end of each chapter hit the shelves August 6, 2013. We are so grateful to our blog readers for cheering us on, and for our editors and marketing team at Zondervan for believing in this book. We are beyond blessed. Click on this link to read a chapter excerpt from We Laugh, We Cry, We Cook. Click on this link to listen to a clip of the audio version. Johnson, author of a number of books, on subjects ranging from family humor to brain science, and Randolph, her grown daughter, team up in this quirky memoir with recipes. Johnson, diagnosed with Inattentive ADD, is scatterbrained, sloppy, and disorganized, while Randolph likes her ducks in a row. “Organization was my form of teenage rebellion,” writes Randolph, while her mom admits that during those years, the smoke alarm often served as the dinner bell. Johnson is a self-proclaimed bacon and butter lover; Randolph is vegan. The authors toss anecdotes back and forth throughout the folksy chapters, sharing stories of a loving family in which “hospitality is a way of life.” Between slices of life, the mom-daughter duo offers an eclectic array of recipes (main entrees, sides, appetizers, soups, desserts, etc.) ranging from spicy puttanesca sauce to cashew queso and roasted corn bean salsa (Randolph lives in Texas, while Johnson resides in Colorado). Recognizing that many contemporary families, like theirs, include members with varying dietary preferences and needs, the authors provide instructions on how to alter recipes to please and appease vegetarians, vegans, and the gluten-free. Amusing, endearing, and spiced with a close mother-daughter bond, the authors interweave their humor and cooking advice with sincere gratitude for the blessings of breaking bread with family and friends. “Unique. Special. Surprising. Entertaining. Humorous and heartwarming. You will be rolling on the floor laughing one minute and wiping a tear the next, while simultaneously whipping up a creative recipe for your family. “From the moment I received We Laugh, We Cry, We Cook, it was constantly in one hand while the other tended to kid-tastrophies. Rachel & Becky created a tasty memoir full of authenticity in the trenches of motherhood. If feeding a family is love—this is one book that will nurture any mother’s heart and soul! “With poignant stories Becky Johnson and Rachel Randolph show the beauty of a mother-daughter relationship no matter the differences, and how feeding others is an act of creativity, love, and a generational legacy. An inspiring, delightful book. “A lighthearted look at the food we feed our families and the thoughts and feelings behind it. I enjoyed this book from cover to cover. Looking forward to cooking more as I love my family well! Oh, Mindi. Thank you so much! We loved writing it and are so encouraged when we hear that readers are enjoying it. Blessings from our kitchen to yours!